By default, Blogger offers you a default static blog header including title and description of your blog. Further you can display image or logo with your header too. Does it bugging you? The way how your header is. Do you think you could have done more to your header if you can use a custom header instead of default one? If you are not prefer the default header style, you will seek around a way to customize or add a custom header for your blog. As far as if you have tried it by yourself, you may have find that current blog header is cannot move a bit or remove it. So you might have wonder why you can't remove default Blogger header and add a new custom header to your blog. Still wondering? It seems you can't touch or remove default header to use custom header, but you are absolutely wrong until you find how to do it. Blogger made the header element locked by itself to not to remove by general users. So they have to use default header with blog title, description and eligible header image. But it doesn't mean Blogger doesn't let you hack it and implement a new one. You just need to find how to do it. Here we will discuss how to remove your current header safely without affecting to your existing blog and let you implement your own header on it. I hope you would love to go through and add your own custom header to show off to your visitors. Why waiting? Let's start. 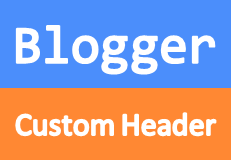 * If you wanna know how to customize the existing blog header, read How to Customize Your Header in Blogger. * If you are looking for adding a header image for you blog using dynamic views, read How to Add a Header Image for Dynamic Views in Blogger. 1. Navigate to your Blogger Dashboard. 3. Move on to Template tab from left pane. 5. Now search for following or similar line of code in your template which relates to your blog header section and alter attributes using regarding attribute information indicated. This attribute specifies the maximum number of widgets can be included in header section. The default value is 1. So, by default, you can't add widgets more than one for your header section. By changing this value, you can allow adding more widgets for header section. Though you specified a new maxwidgets attribute value, you may not see Add a Gadget link at Page Elements page until you change this attribute value to yes. Change value to yes as you gonna add new custom header. 6. 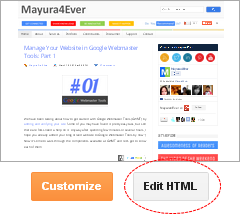 Now you can add custom header for your blog. But before you proceed, let's remove current header on your blog. You can find the line similar to below, just after the line of code we discussed in step 7. 7. Change the locked attribute value to false. 9. Go to Layout tab. 10. Find the Header element of your blog. 11. Now click Edit link correspond to the header. 12. On the immediate pop-up box, click Remove button and confirm removal. 13. Now your default header has been removed. You can see Add a Gadget link at the place where default header was placed before. Click on the link to implement custom header. Note: You can add more gadgets which seems to be suite to your header section (except to the main header) upto the number of widgets you allowed in the header layout code at step 7. You are awesome! My title is a bit to the left, but maybe it's just the picture size. Thank you so much!. If you have further issues on this criteria, please feel free to drop your comments or use our Support section if you need specific assistance. Thank you! It really helped alot.. Well, I am using a custom template, and it seems that I have two Headers, so the one I just cutomised moved to the left.. I was wondering, what should I do to make move it to the centre to cover the whole top area ? I have been going nuts trying to replace my Minima title header with a customized text title. I followed the instructions above but still can't see my custom header. Weirdly, the custom header shows up when my blog is viewed on a mobile device, but not on a computer. Any advice or help you could offer would be greatly appreciated! I'm not sure why you're getting that message. My blog isn't restricted or blocked from public viewing. Uh, I thought I had done that already. I don't know how to delete or sidestep that standard header. Blogger won't let me skip adding a title. FINALLY figured it out. Took me ages to find the "Page Elements" tab-I had to revert to the old Blogger layout to see it. Thanks so much for your help. Much appreciated! Thank you so much! I was pulling my hair out trying to get rid of the header. You made it so easy. Your site is now in my favorites. You are welcome :) Glad you make use of it. You're welcome Prakhar :) Hope you've already customized your header. If you don't mind my asking, how did you create your header? The design with your favicon and adding the custom search as well? I would like to try something similar for my own blog. I've designed it myself mate. I had to work about 2 days to come up with this design. It's not favicon, it's my blog logo. Well, both are same :) You can add your own custom search like that, read Add a Customized Search Engine for Your Website. But people have different designing skills. Go with yours. Could you tell me what you used to design it? Is the whole header one photo...? You are Awesome..I started a new blog about a month ago and I needed this info to customize my header. Thanks so much. It's not a header mate :) They are tabs referring to each static pages on my blog. You can learn how to display tabs at How to Display Your Standalone Pages in Blogger post. If you have questions related to that, comment under that post. BTW don't expose emails in public mate :) It's a threat to your privacy. I am having a very hard time trying to find the code (or similar) as specified in point #7. Any ideas on how I could do this? I am using one one the simple Blogger default templates. You're welcome Summer :) Glad you find it helpful. hi, i did the change, but how i can i add a random image each time the page loads? Oops... A random image for header? Probably a random image is possible if you use animation as your header to change the image over time mate. Or else you can use flash animation created by you, but that will affect on page performance though. thank you so much this really helped me!!! You're welcome Alice :) Glad to help you out with the tutorial. Thank you for that great tip! Worked perfectly. Thanks for the awesome post! Very helpful! I am wondering if there is a way to make my header image bigger though? When I followed your steps my header image was still the size of just the main header text area (blog title) (400x94) Is there any way for me to make it sit at the top centered and be the width of my blog? Well, your header size is 1000 x 120 dear :) But seems like the template designer changed the header size to be 400 x 94. Thank you so much. This work perfect. You can continue to next step :) Seems some blogs doesn't show a warning message with Proceed button. Thank you so much! This was a great help! Do you have more posts about blogger? I'd love to go through them! This was so helpful! Thank you so much this was just what I was looking for. It worked! Thanks so much for this! You're welcome, Ms. V :) Glad to hear you have made it!